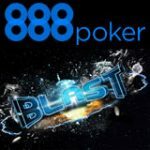 Sign-up to 888Poker and get a free $8 no deposit poker bonus, for a limited time period players that make their first deposit qualify for a 888 Poker Super Welcome Bonus. Make your first deposit using the 888 Poker Promo Code before the 5th December 2012 to qualify for one of the biggest online poker bonuses. This offer is for new players who have not yet made their first deposit on 888Poker. The 888 Poker Super Welcome Bonus is only available to players from the following countries: UK, Canada, Australia, Germany, Russia, Brazil and Romania. Sign-up and get a $8 free 888 Poker bonus, no deposit required. Deposit and get a 300% first deposit bonus up to $300. 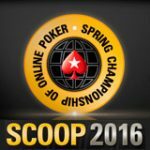 7 days access to the daily $500 First Depositors' Freerolls - $3,500 in prize pools. 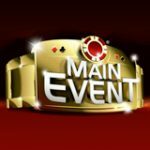 One entry to the weekly $1,000 Depositors Freeroll - $1,000 prize pool. One entry to the $100k First Depositors’ Challenge. SUPER WELCOME BONUS <- click here to claim this 888Poker bonus. The 888 Poker Super Welcome Bonus is only valid till the 5th December 2012, sign-up and use the 888 Poker promo code when depositing. 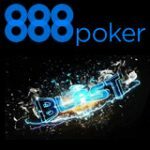 888Poker will triple your deposited amount as a pending bonus up to $300, players can clear their pending bonus by playing cash games or tournaments on 888Poker. The first two parts of bonus will be released as a $5 bonus when 50 Bonus Points are earned. The next eight parts of bonus will be released as a $10 bonus when 100 Bonus Points are earned. The remainder of bonus will be released as a $10 bonus when 200 Bonus Points are earned. 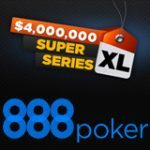 Play for your share of $2 million in guaranteed prize pools in the 888 Poker SUPER XL Series. The 888 Poker series takes place from 17 - 25 November 2012. Daily satellites are running now which offer players the chance to win their seats from as little as 8¢. Play poker on your Android device install the 888 Poker Android App and play poker anywhere, anytime. 888Poker is also available on iPhone and iPad.